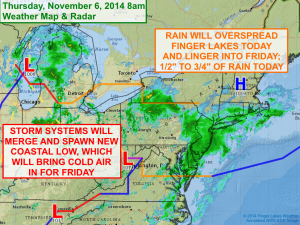 A rainy day is expected across the Finger Lakes Thursday. Click image to enlarge. Today will be a rather wet day across the Finger Lakes as a low pressure drops across the Great Lakes and interacts with a frontal boundary. You can get the details on how this set up will impact us from last night’s entry. For those on the go this morning, here are the need-to-know details of the forecast. Rain will become more widespread as the morning goes on and will last into the afternoon. 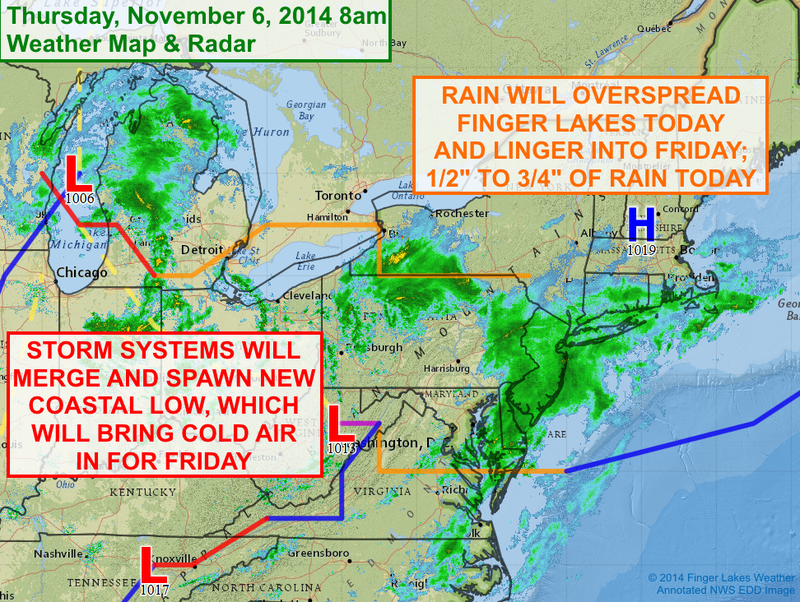 Precipitation becomes more showery in nature later this afternoon and into Friday. Snow may mix with the rain tomorrow with a coating or slightly more in the higher elevations Friday evening. Don’t forget, you can track the rain at any time on the radar page.